When you are looking for a way to finish the edge of your next embroidery project, a self-fringed edge is both decorative and easy to create. And it doesn't even require a sewing machine! Hemstitch is what creates this finish. It's commonly used in drawn thread embroidery and is very easy to learn. It is so easy, in fact, that you'll soon be looking for more projects to put this process into use. This type of edging is perfect for making a tablecloth, runner, napkins, coasters, mats. or as the bottom edge of a wall hanging. You can use it to hem all four sides or in combination with other edging and hemming techniques. To make a project with a self-fringing edge, you will need to work with evenweave fabric or a linen that is nearly an evenweave. Different weights and threadcount will alter the result, so you may want to test a swatch before committing to a fabric for your embroidery. You can adjust the size of the fringe, both in length and thickness, so there's a lot of room to customize this type of finish. Another way to tailor your edging is with the thread you choose for the stitching. You can match the color to the fabric you're using or choose a contrasting color as shown in this tutorial. Use a thread weight that is similar to the warp and weft threads of the fabric or uses something a little thicker for a bolder finish. For example, size 8 Perle cotton is shown above. When planning your project, be sure to allow ample room around your embroidery for squaring the fabric and creating the hems and fringe. Then when you're all done stitching, start adding your fancy fringe! Before you start stitching the edge, it's important to square off the edges so the fringe is straight and even. You could trim it later, but it's much easier to begin with good edges. Decide where the edge of the cloth should be and carefully pull a thread out from one side to the other. You may wish to pull two threads. Use this pulled thread line as a guide for cutting the edge. Repeat for each of the four sides. The photo above shows the crisp line along the top that was trimmed with this method. Measure in from the edge the exact length that you want the fringe to be. Pull two to three threads at this measurement. Repeat this for each of the sides you are fringing. If you find it tricky to get the thread pulled, a tweezer may help get it started. Pull gently to avoid breaking the threads. If a thread does break, use a needle to work the end out and begin pulling again. Ironing the fabric after you're finished keeps the threads aligned and easier to work with. There are different methods for working a hemstitch, including several decorative variations. The photos show one basic version and an alternate method is described as well. 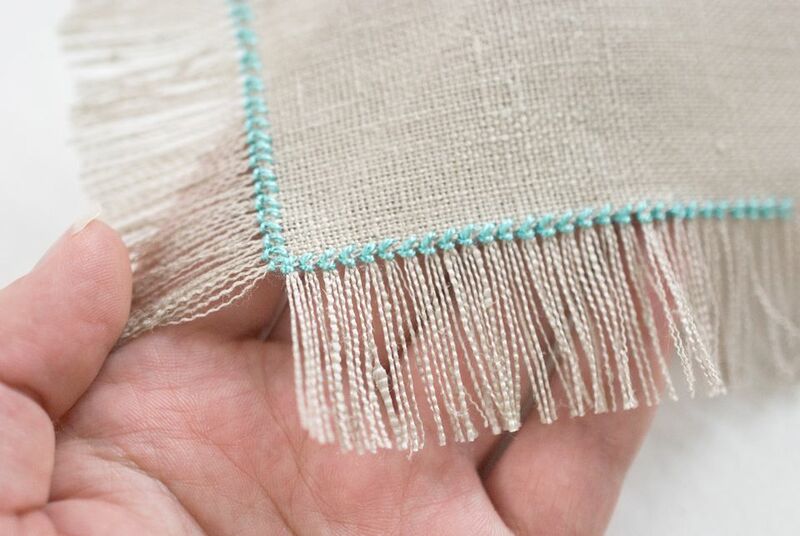 To work the hemstitch, first decide how many threads you want in each bundle of fringe threads. Depending on the fabric you're using and how fine or thick you want the fringe, two to six threads usually work best. It's easier to start in from the corner just a bit. Bring the needle up through the fabric two threads below the line of pulled threads, leaving a one-to-two-inch tail behind the fabric. Count the number of threads that will be in each bundle (three, in this case). Slide the needle behind that number of vertical threads just to the right of the point where the working thread comes through the fabric. The method above works from left to right and makes a more bold hemstitch. For a more subtle stitch, work from right to left. To do this, slide the needle behind the number of vertical stitches just to the left of the point where the thread comes through. The needle still goes from right to left, but it starts directly above the working thread. Rather than making a diagonal line from left to right, it will end up making a tiny diagonal line from right to left. After sliding the needle behind the vertical threads, bring the needle back the right side of the grouped vertical threads. Insert the needle vertically in the gap, as shown above, and then bring it back to the front two horizontal threads below the gap. Pull the stitch tight enough to bundle the vertical threads. When you are working the stitch at the beginning of a length of thread, you should catch the starting tail with this stitch. Do this as you continue stitching, securing the tail without a knot. Now the working thread is in position to repeat the process, starting from the previous step. If you are working the more subtle version of this, insert the needle diagonally in the gap and then bring it back to the front two horizontal threads below the left side of the grouping of threads. Repeat the two previous steps along the edge of the fabric until you reach the corner. With some luck, the number of threads will come out even, but that's not always the case. Pay attention as you are approaching the end of the edge and space out the threads as needed to keep the bundles looking as even as possible. To turn the corner, slide the needle behind the last grouping of vertical stitches and then take a diagonal stitch at the corner. Continue stitching as before. If you are working the alternate method, the process is essentially the same as though you are stitching along the edge. Simply turn the corner. When you end a thread–either because you've run out of thread or you've reached the end of your stitching–slide your needle through the small stitches on the back of the hemstitch. Slipping the thread tail through these stitches will secure the ends. After all of the hemstitching is finished, remove the extra edge threads, creating the fringe. It's best to pull them away one at a time. Smooth out the fringe, gently iron the edges and your piece is ready for gifting or display. Why Should You Know About Warp and Weft in Embroidery?